Seat cushions: qualofil fibre as standard. Also available in supalux foam â€“ please specify. Wood finish: available in smoke with nickel or antique with brass castors. Wood only option also available â€“ please specify. Options: grand sofa is permanently split. 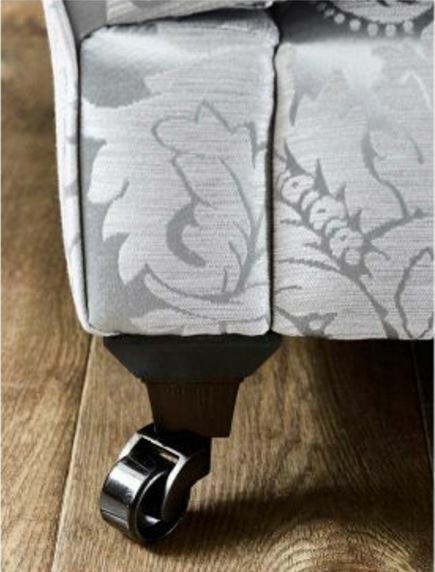 Sofas and snuggler are available with fixed arms or knole drop arms. Feet are removable. A true classic. Elegant and sophisticated, this timeless collection looks fresh and modern in a rustic setting and glamorous and decadent in the traditional home. Sumptuous fabric combinations available. â€¢17 plains, 6 stripes and 6 patterns. â€¢Qualofil seats as standard. Supalux foam also available. â€¢Feather filled scatters and bolster. â€¢Knole drop arm and fixed arm options. â€¢4 wood finish options â€“ smoke with nickel or antique with brass castors. Wood only also available. â€¢3 sofa sizes, 2 chair styles and 2 storage stools sizes. The Buoyant Cadiz Arm Chair is part of the Cadiz range by Buoyant Upholstery, a modern range available in a three seater sofa, two seater sofa, armchair and as a 2 piece corner unit. It is also available in a variety of colours in outer fabric Aero, Janice, Mac, Marie or Saddle with Inner fabric Aero, Arizona, Casper, Jade, Mac or Marie. You have a further choice of chrome, dark or light feet.